Anxiety is spreading worldwide after 103 Mexican citizens have died of swine flu in recent days. An Israeli man who returned from Mexico on Sunday has been admitted to the Meir Medical Center in Kfar Saba and put in isolation after exhibiting suspect symptoms, including fever and coughing. Deputy Health Minister Yakov Litzman held a press conference Monday in order to update the public on developments regarding the epidemic in Israel, and recommended to use the term "Mexican flu" rather than "swine flu" for the virus. According to Litzman, there was still no formal recommendation against travelling abroad, but he added that it was advisable not to go to Mexico. He said that there was no indication that the virus has made it to Israel, but that due to the constant air traffic between Israel and the United States, cautionary measures and monitoring was required. The deputy health minister said he was briefing Prime Minister Benjamin Netanyahu, who also serves as health minister, on the developments twice a day. Health Ministry Director General Prof. Avi Israeli said that "the public should remain alert and stay tuned to instructions." 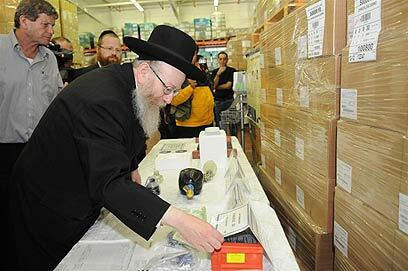 Litzman said that Israel has enough drugs to treat 18% of the population and that a budget for purchasing drugs for 25% of the population has already been approved. Danny Laor, head of the Health Ministry's Emergency Unit said that Israel had 11.7 million Tamiflu antiviral pills in store, a quantity sufficient to treat 1.1 million people. Additionally there were enough pills in dosages suited for children to treat 200,000 children. He said the Emergency Unit also has 3,000 respiration machines. "If there's a catastrophe and the need arises to immediately increase the stock by several million pills this should not be a problem thanks to various agreements we have," he added. 26-year-old Tomer Vajim was hospitalized Sunday at the Laniado Hospital in Netanya after returning from Mexico with signs of flu. The man has been isolated and doctors tried to determine whether he has been infected with the swine flu virus. The hospital's director-general, Prof. Avinoam Skolnik, told Ynet he believed the young man does not have swine flu. "I'm saying this based on doctors' tests and based on the results of some of the lab tests." See all talkbacks "Swine Flu: Second Israeli hospitalized "